In the span between the pseudo-conclusion of the recount last Friday, and today, the flow of actual information has essentially ceased; having been replaced by the battle over public perception. With the first round of challenge withdrawals having already taken place, each candidate decided a second round was in order. The Franken campaign announced today that it was withdrawing an additional 425 ballot challenges, bringing the total number of challenges withdrawn by Franken to 1,058. The Coleman for Senate campaign today announced it would be withdrawing an additional 475 challenged ballots ahead of the Minnesota State Canvassing Board meeting to review these ballots next week. On Thursday, December 4, the campaign withdrew 650 challenges for a total of 1,125 challenges withdrawn by the Coleman campaign. There is absolutely no data available to access the relative difficulty associated with reaching any challenge percentage in the above graph. 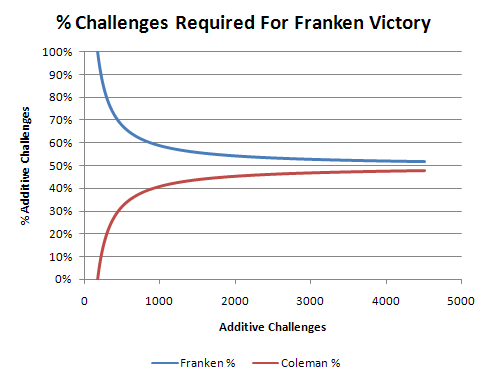 The graph simply presents the outcome necessary for a Franken victory based on the currently available data.